Private collectors have contributed their works to create a museum of La Jeune Peinture and organise, in France and abroad, major exhibitions on this movement. This site shows part of this exceptional collection with many historic paintings by Françoise Adnet, Richard Bellias, Bernard Buffet, Simone Dat, Michel de Gallard, Raymond Guerrier, Roger Lersy, Bernard Lorjou, André Minaux, Jean Pollet, Paul Rebeyrolle and Michel Thompson. It aims to be a visual reference and an educational tool for understanding art history in the second half of the 20th century and the role of La Jeune Peinture. Please do not hesitate to contact us for any requests for publication projects, lectures or exhibitions. 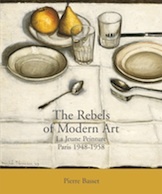 "The Rebels of Modern Art"
THE REFERENCE ON LA "JEUNE PEINTURE"